So I wonder how do I know which posts were useful or fun to read to the readers? Cbox is my preference, but the message does not tie to the particular post, same goes to Pingbox. 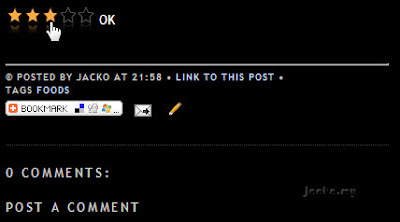 Comment field was a little tough that it took few clicks to open a new page to post a comment. What else do I have as options? Before I ventured into other options, I looked into the Settings page if there is any new features available. I found that now the comment form can be embedded into the post page! I recalled this feature wasn't available when I setup my blog. So now I embedded the comment form into the bottom of the post, thus one can directly post a comment without leaving the post, word verification is required though to avoid spamming. I tempted to allow anonymous comment but I did not 'cause I have also been receiving spam comments even with Open ID. You can click on "Subscribe to email" to follow up the comments if you posted a question. No worries, you can unsubscribe anytime by click on the same link again. What about some readers who only want to leave something quick without typing? There is an option now. I added a new widget to every post, now you can see some "stars" at the end of each post. 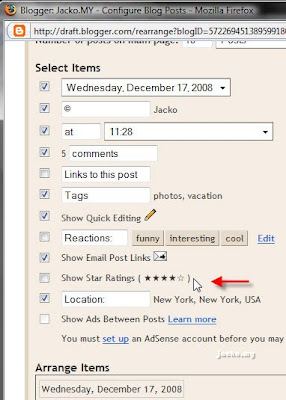 Hover your mouse cursor to the stars and click to rate the post accordingly. I wanted to add this widget long ago but I was testing its feature and had some issues with my blog template. I was really impressed with the technical support and customer service I received from the provider, special thanks to Kate and Daniel! Blogger does provide the same feature. 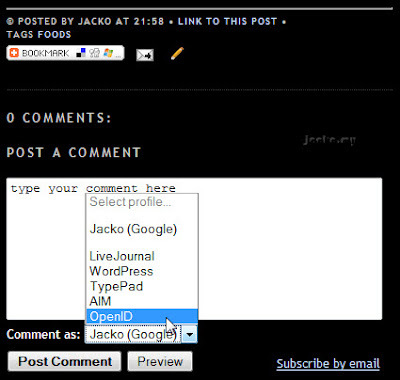 It's still in pilot mode but you can enable it on your blog by logging on to http://draft.blogger.com/. This is the Blogger Dashboard where you can find some beta features that are yet to be published at Blogger.com. And I tweaked the "Read More" link a little too. Now you don't have to scroll from the top after you click on it at the main page, the link brings you to where you were at the main page and leaving 1 or 2 lines above to help your continuous reading.